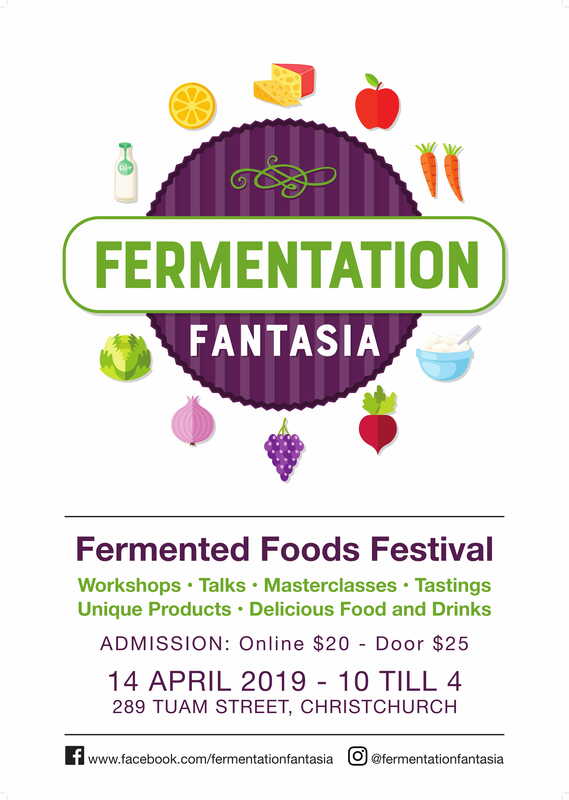 Come and see us in Christchurch on Sunday April 14 at the Fermentation Fantasia. 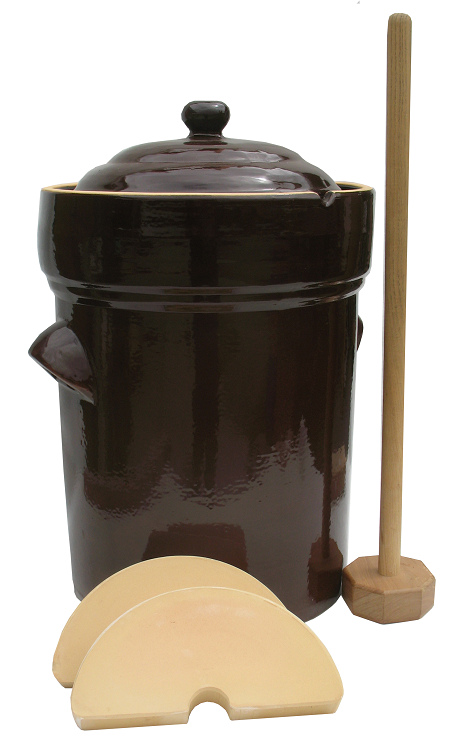 The special feature of fermentation pots is the lid fitting in a circular grove that is filled with water like a moat. 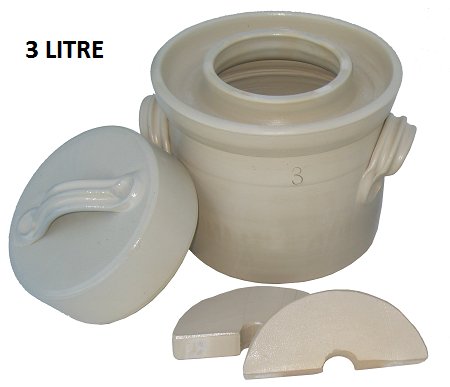 This water seal is a fermentation lock and allows fermentation gasses to escape, without allowing air to enter the pot. 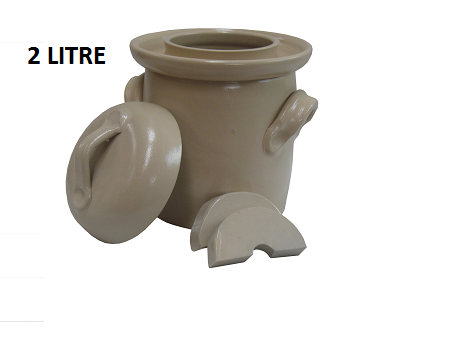 This feature reduces dramatically the formation of mould inside the pot. 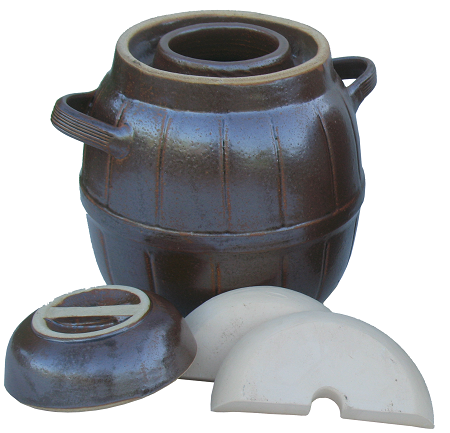 Half-moon weights are supplied with each pot. They keep the vegetables covered in liquid for long conservation. 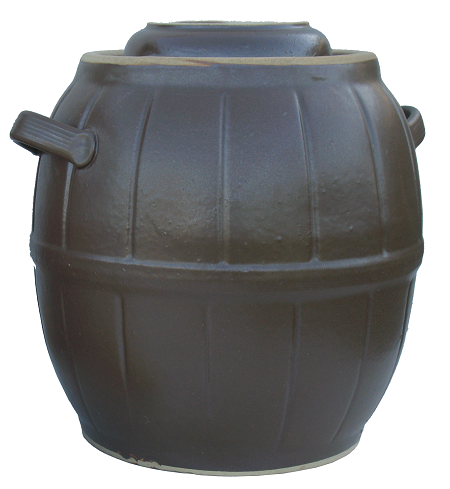 The pots are made of pottery clay and baked at 1200℃ and covered with a lead-free glaze. 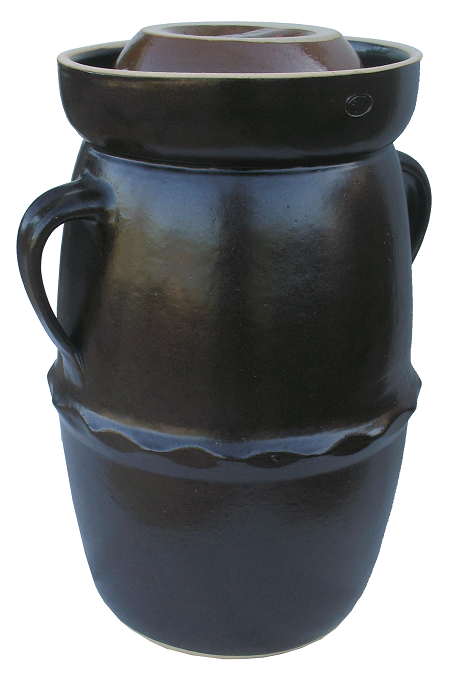 The smallest pots, 2L and 3L, are made of salt glazed stoneware. Stoneware is a finer clay that is baked at a higher temperature, 1300℃. 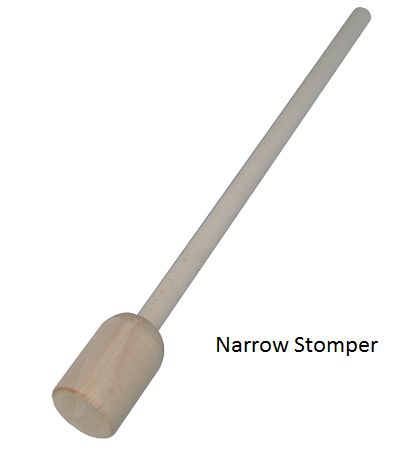 It yields a denser, stronger and impervious object. Salt-glazing gives a glossy, translucent glaze with slightly orange-peel-like texture. Common salt (NaCl) is introduced to the kiln during the higher temperature phase of the firing process. The high temperatures cause the salt to volatize, depositing it on the surface of the ware to react with the body to form a sodium aluminosilicate . 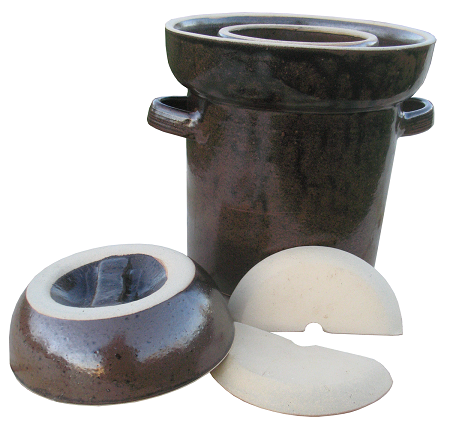 The glaze may be colourless or may be coloured in various shades of brown (from iron oxide), blue (from cobalt oxide), or purple (from manganese oxide). More on fermentation, click here. FERMENTATION: Our scientists have realized that fermentation is not just a food preservation technique. Fermented foods are better for your health, for your intestines, for your digestion and for the release the micronutrients contained in plant fibers. They are rich in probiotics that we need to compensate for the havoc on our gut bacteria caused by antibiotics, refined foods, prepared foods or stress. With the exception of the potato, all vegetables can be fermented: carrots, beets, green beans, celery, eggplant, zucchini, cucumber, etc. Their precious vitamins are fully preserved and others appear, especially C, as well as B and K.
During fermentation, lactobacillus-type bacteria feed on vegetable sugar and release lactic acid. This is the origin of the acid taste of fermented foods (eg sauerkraut). The acidity will eventually kill the bad bacteria. This is how you will avoid putrefaction and the reason why the fermented product must always be submerged. These good bacteria stimulate the intestinal flora and facilitate the work of the digestive system as soon as they enter the intestine. An intestine that functions well, is the keystone of the immune system. Note that fermented foods are best eaten raw to preserve their profits.  In maintenance: a tablespoon of lactofermented vegetables is a mine of nutrients. Consume it at the beginning of the meal to enjoy the digestive enzymes that allow you to better assimilate food.  In cure: when you need to regenerate or disinfect your intestines (irritable bowel, gastric reflux, intestinal parasites, digestive inflammation ...) gradually start with 1 tablespoon at each meal, increase according to your tolerance up to 2 to 3 spoonfuls per meal for a week. The lacto-fermented vegetable juices can also be enjoyed as an aperitizer, for a small glass at noon and at night for 3 weeks, especially at the beginning of winter to restore tone and fight against vitamin deficiencies. If you have never practiced fermentation, rest assured, it's almost unmistakable. 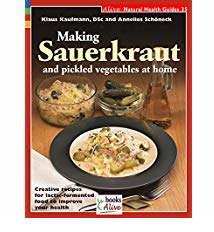 For a recipe and tips to make sauerkraut, click here.  Choose large and tight cabbages. Five cabbages for a 12-litre pot should do.  Remove wilted or damaged leaves.  Weigh the cabbages and prepare one to two per cent of their weight in salt.  Remove stalk and shred finely in a large bowl using a large and sharp knife, or a cabbage shredder.  Add the shredded cabbage to the pot, 5cm at a time, and compact with a masher or with the fist; sprinkle some salt, add some spices like bay leaves, cumin seeds, and/or juniper berries.  Repeat layer after layer. At the end, add the remainder of the salt, cover with two or three whole cabbage leaves and place the weights on top.  Keep at room temperature for a few days, then find a cooler spot (12 to 18°C if possible).  Bubbling indicates the beginning of fermentation.  After three days or so, press on the weights and check the level of the liquid. If necessary, add some cool boiled water to keep the vegetables covered.  After four weeks, the sauerkraut should be ready. It is advisable to remove some sauerkraut at least once a week, testing to avoid the flavour becoming too strong. Otherwise remove some juice and add cool boiled water.  Salt is required to make sauerkraut or pickles (about one to two per cent of the weight of the vegetables). Do not use iodized salt, as iodine prevents good fermentation. Pure salt is on sale in supermarkets. It can be coarse, as it will dissolve.  Cleanliness is of utmost importance.  The weights should provide the necessary pressure to keep the vegetables submerged in their juice. 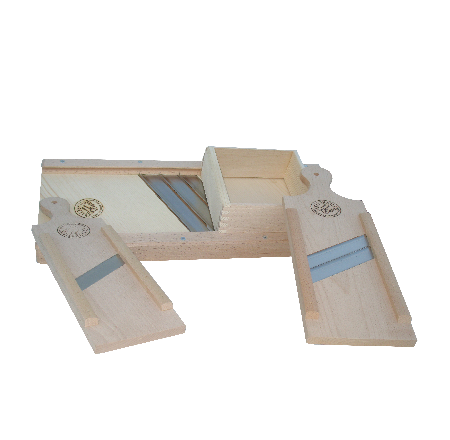 If the weights had to be replaced for some reason, never use limestone, as it would react with the lactic acid produced in the fermentation process. 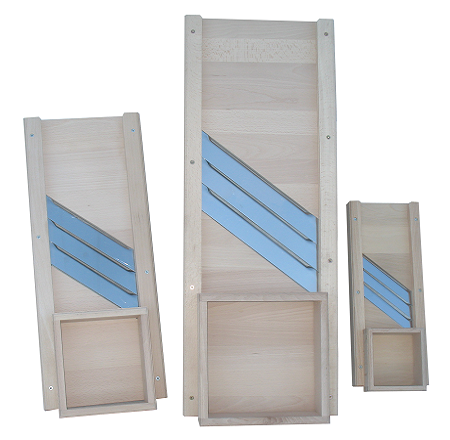  Monitor the evaporation of the water in the water grove. Lift only the lid when necessary. Line the pie dish with the crust. Spread evenly the sauerkraut. Top with very finely shredded onion. Garnish with olives cut small, sprinkle nutmeg and oil over the whole surface. Bake in a hot oven for 20–25 minutes. The onions will take some colour. Cover with foil if colour too dark. The sauerkraut will still be raw, although hot. Serve hot. 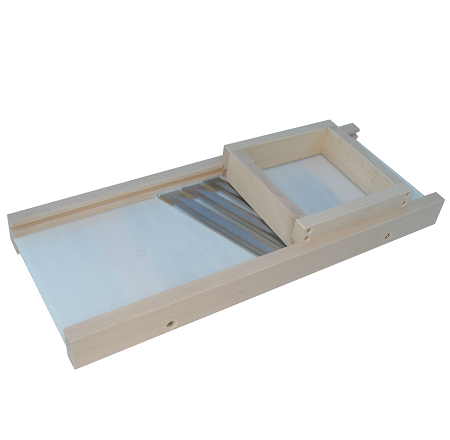 A type of mandoline where a square wooden frame contains the cabbage to be sliced finely which slides up and down. It is pushed back and forth with the hands, which presses on the cabbage at the same time. The shredding is efficient and fast. 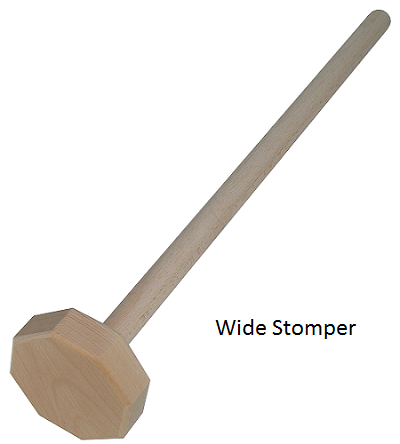 The stompers are wooden and efficient for compacting the shredded cabbage. Here are the various pots/crocks and accessories. 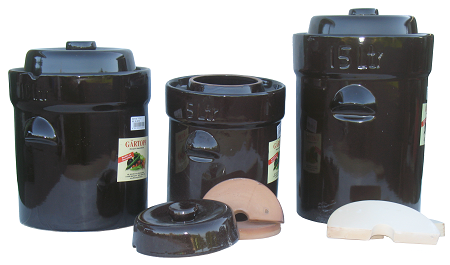 Two 6-Litre pots made in the Czech Republic, one barrel shaped and one cylindrical, Contain up to 3.5kg of compacted shredded cabbage. 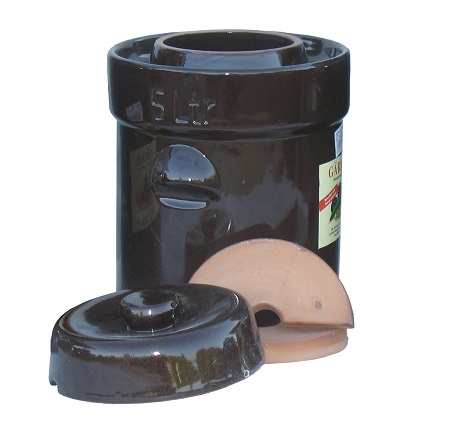 The cylindrical pot has a particularly large water lock.